I have some ideas for new routes / climbs and I’ll visit some of the old classics as usual. I won’t blog every ride, just the special ones. Me and the boys from St Etienne won entries into this fantastic event after three straight years of losing the lottery. I rode it with Martin in 2009. It is easily the best run, most beautiful event I have ever completed. No clue if my leg will hold up, but there is a short loop option of just doing the Sella Ronda. My brave wife Doreen has set a goal of riding the Sella Ronda the day after the race, and this has the potential to be the best day of the year on a bike. I’ve been doing cardio in the gym for a month and have had a few easy outdoor rides. And this week ….. did my first climb in quite some months. 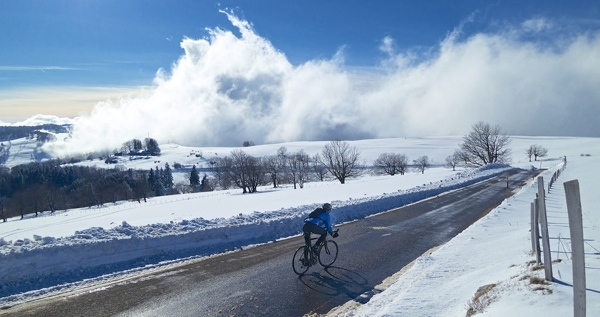 A beautiful snowy ride up Mont Saleve (photo at top). 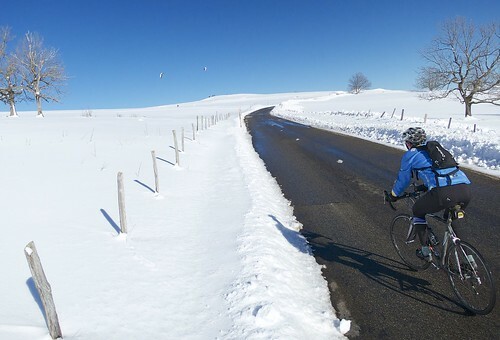 For details on all five routes up my home mountain – Mont Salève – see here. Good luck with your 2014 plans! I’ve enjoyed following your site over the years, so I hope you’re still able to ride to your heart’s content! Best of luck! Very good to see you posting again, Here’s hoping for complete recovery soon and more climb reports. I must get over to France and ride after seeing those spectacular high dirt roads near the reservoirs. great to see that you’re back on the saddle and already mastered a col! I hope the knee will get better as spring approaches so that we can ride a (gentle) climb together soon. Good recovery and keep your spirits up ! Glad to hear you are back on the bike and look for ward to your motivational posts in 2014. If you are down near Ventoux drop me a line. it’s great to see that you’re back in the saddle! I hope the knee holds up ok & allows you to achieve 50 great rides! I’ve been following your site for the last 4 or 5 years & always look forward to reading about your new adventures. 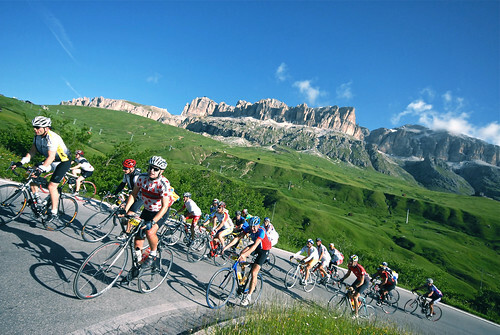 Keep blogging & enjoy yourself – good luck for the Maratona! Good for you! Glad to see you are back in the saddle, and wishing you all the best for the 2014 challenge!! Best of luck with the knee and 2014 (does doing gymnastics for col sign photos help!?! 🙂 ). I’ve had my share of knee pain.